I've been trying not to spend money when suddenly I was wandering in the shops on a lovely Saturday and somehow ended up in Jack Wills. Yes, I know if you don't actively go shopping you won't be tempted, but what's the fun in that? Jack Wills is a British brand that reminds me a bit of Abercrombie & Fitch. Their main concept is utterly British and outfitters for university students. Real posh and typical British middle upper and pseudo upper class. I say 'pseudo upper' cos I don't really think super posh people would shop here. Maybe I'm wrong. I'm still a foreigner here after 8 years! :P I don't mean to offend. I really dig their look. Very classic. A few of the dresses caught my eye. Aren't they cute? So I decided to treat myself to the Mablethorpe dress. It looks beyond adorable on. I know I shouldn't have but I deserved a treat. Let me explain! Any thoughts on Jack Wills? Or workouts? 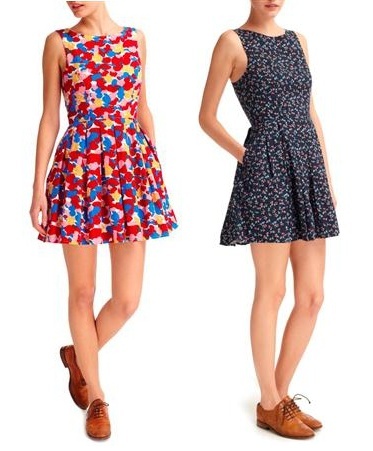 I've never heard of this brand before, but the dresses do look really cute! Good look on starting to work out again. I should really work out today but I'm just so comfy in bed! Thanks! I'm really loving the dress I bought here. And for the workouts, still going strong! It's hard to look good, apparently!